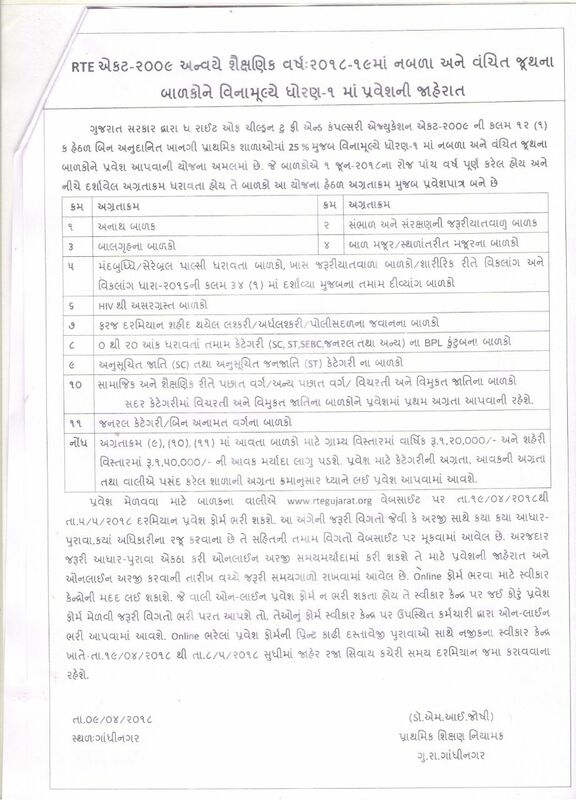 RTE Gujarat Admission, www.rtegujarat.org, RTE Gujarat Admission 2018/19- www.rtegujarat.org: Government of Gujarat, Education Department released notification regarding admission in standard-1 as per Right to Education norms. Subsequently, all the selected students will get 25% reservation in admission in various schools of Gujarat. Eligible and interested applicants may read full advertisement carefully and apply online RTE Gujarat Admission 2018/19- www.rtegujarat.org. 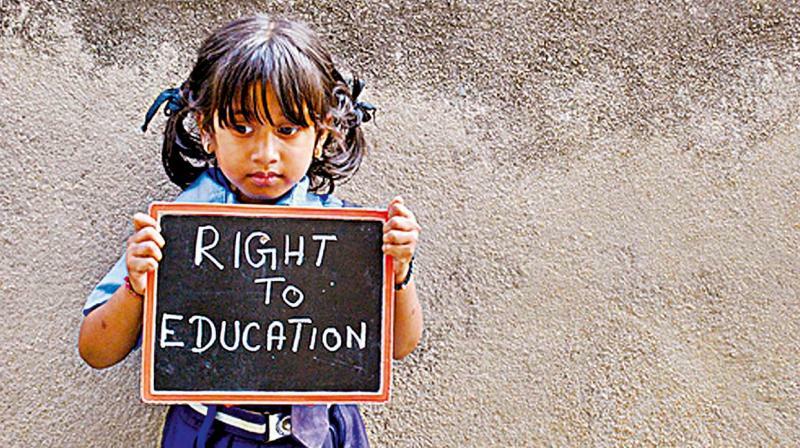 The Right of Children to Free and Compulsory Education Act or Right to Education Act (RTE), is an Act of the Parliament of India enacted on 4 August 2009. The act describes the modalities of the importance of free and compulsory education for children between 6 and 14 in India under Article 21a of the Indian Constitution. The Act makes education a fundamental right of every child between the ages of 6 and 14 and specifies minimum norms in elementary schools. It requires all private schools to reserve 25% of seats to children (to be reimbursed by the state as part of the public-private partnership plan). Kids are admitted in to private schools based on economic status or caste based reservations. It also prohibits all unrecognized schools from practice, and makes provisions for no donation or capitation fees and no interview of the child or parent for admission. The State Government has declared a fixed pattern for Gujarat RTE Admissions. As per the official notification, each school must reserve some seats for the poor candidates. All these candidates can fill the RTE 2018-19 Online Application Form after which a lottery will open. Afterwards, govt. will declare the results of RTE Gujarat Admission 2018-19. Application forms are usually distributed in February On completion of the forms, they will have to be submitted in one of these collection centers. Candidates have to fill the application form online through the official website of RTE Gujarat Admissions. Applicants have to go on official website www.rtegujarat.org. Navigate arrow to Online application. Read all instruction well and fill necessary details. Submit online application and take print out form. Submit application form & documents at receiving center on or before last date. 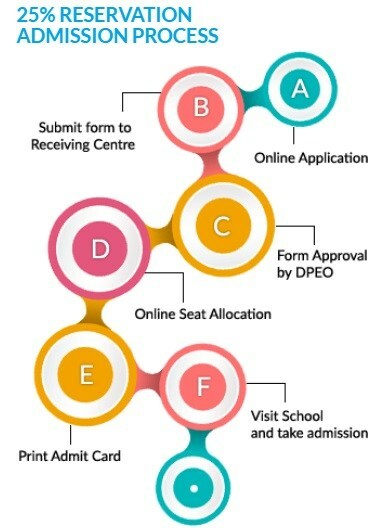 If the person who can not fill the online admission form, they may first receive a blank form and return the filled form to fill in the required details, to the acceptance center. Their form will be filled online by attending center cross attendance staff. After that applicants should have to take print out filled application form and submit it at nearest receiving center on or before last date during the office hours except public holidays. 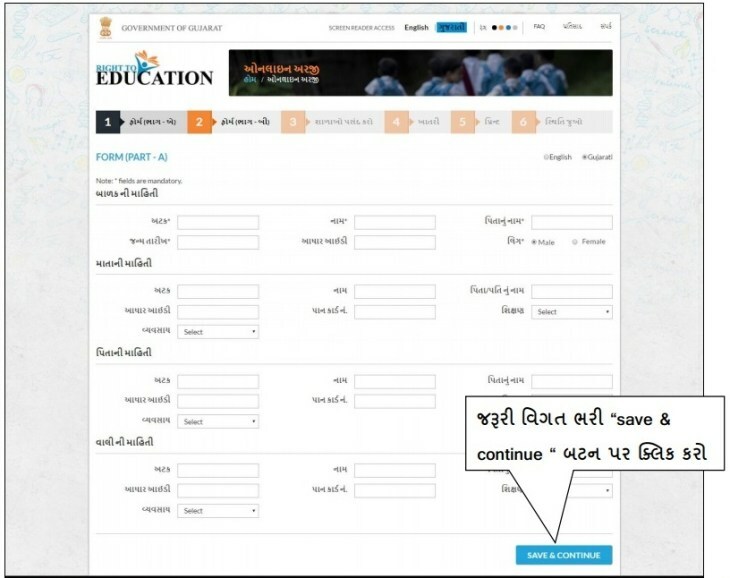 Government Of Gujarat, Education Department start RTE Gujarat Admission 2018-19 on its official website. Eligible and interested candidate may apply online through its official website. Online application start from 19th April, 2018 to 5th May, 2018 on its official website. 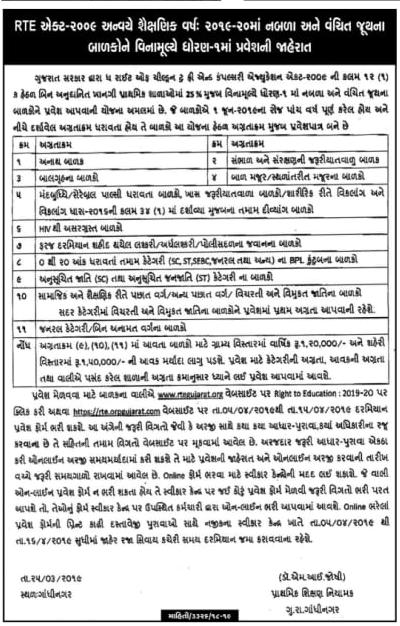 Gujarat Government Education Department published advertisement for apply in Standard-1 as on RTE norms. RTE Gujarat Admission 2017 online application fill start from 21st February 2017 to 15th March 2017. Fill Online form and attach Necessary Documents and submit all document to receiving center. There are 451 Receiving centers open in Gujarat State. As per RTE ACT 2009 eligible candidates apply online for admission in standard-1. Download PDF Notification from official website www.rtegujarat.org Candidates who want to apply for admission in standard-1 they can read instruction well and than apply online. RTE Gujarat Admission 2017 online application start from 21st February and last date for submit form is 20th March 2017. Parents who want apply for thier child in standard-1 they can apply online from RTE official website www.rtegujarat.org. If you have any query regarding RTE Gujarat Admission don’t hesitate to share with us. Leave your Comments/ query in the comment box given below. We will try to assist you. Candidates are advise to bookmarks this page and be regular touch on this page for get more latest updates about RTE Gujarat Admission – www.rtegujarat.org. Next some day application start for RTE Admission academic year 2018-19. May be in month of February 2018. Please Keep Visited, we will inform u soon. RTE Admission notification will be announced on month of February 2018. Please keep visited our page for latest updates. RTE Admission will be start on month of February- 2018 for standard 1st. Official notification will be announced soon. Please keep visiting page for more information. RTE Admission 2018-19 will be announced soon on Month of February 2018. Yes, You may fill admission form online and submit hard copy at receiving centers with necessary documents and proof. cast certificate compalsary hai kya??? All information available on this page. Please read Carefully. RTE Admission 2018-19 notification announced soon. All information regarding certificate mention in official notification. 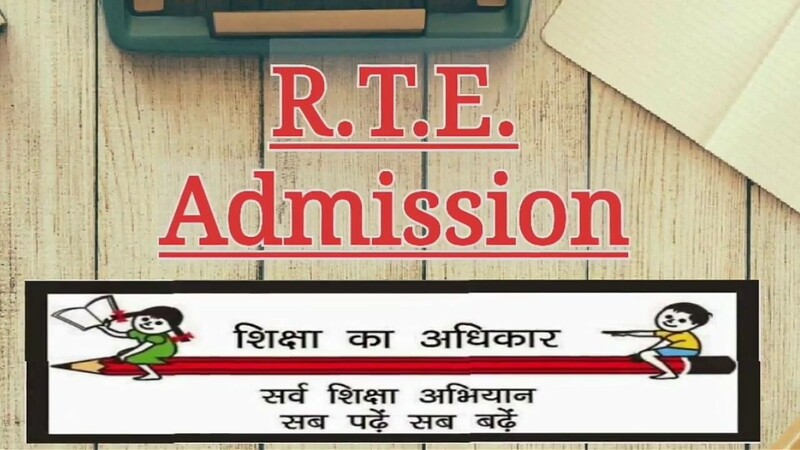 RTE 2018-19 ke application form kab nikalenge ? please give answer. 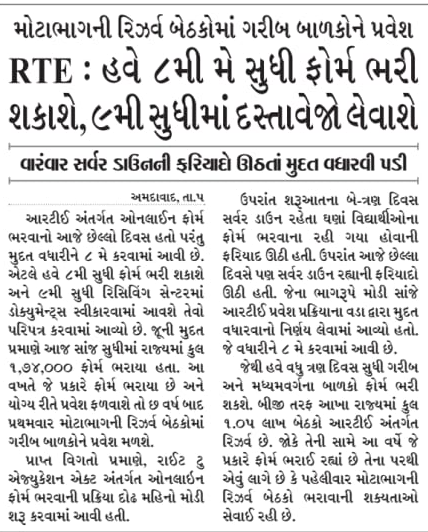 RTE Gujarat Admission will be announced soon. Please wait and keep visiting this page. We will provide all information on this page. My child born in November 2012, she is studying in jr kg, can she apply this year or next year, can you please give me age instructions? official notification announced soon. All information regarding admission available in notification. Please wait and keep visiting. Admission will be start soon. RTE Admission 2018-19 announcement soon. what will be process of Rte Admission Gujarat when Document Proof is not a Present City? Kindly try to get address proof.Still RTE Gujarat Admission process not start. You may try to complete your work in short period. Best of luck. Second Round will be start soon. We will inform you soon. 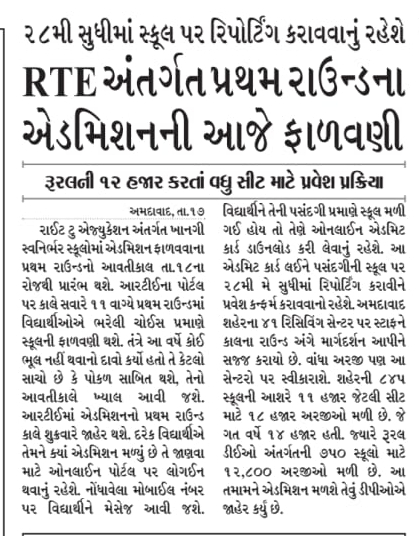 RTE Gujarat Admission will be start after 12th March, 2018. 12 MARCH NAHI Hu a aagla date kon sa he sir…..
Next Date will be announced Soon. RTE Gujarat Admission start soon. Please keep visited this page. 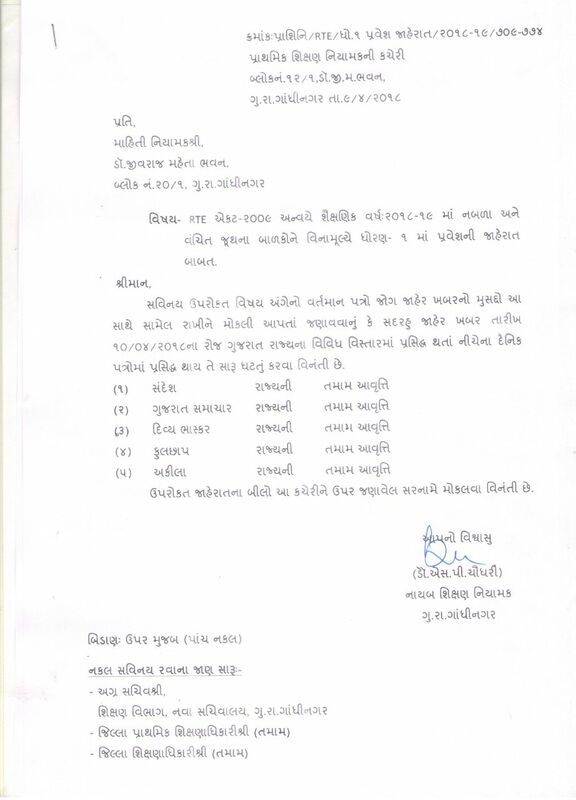 New Date RTE GUJRAT ADMISSION PLEASE START AND CLOSE DATE …..
થોડા દિવસોમાં RTE Admission ચાલુ થશે. રાહ જુઓ. Rah jovani limit hoy. 2 months late atli rah koi na joi sake. It will be start soon. RTE Admission will be start from 19-04-2018. RTE Gujarat Online Application will be start soon. Please Keep in touch with our page. Please read Required Documents List. All Information available. Gotala janta k samne lao. Cbse school ka naya satra shuru bhi ho gaya or yaha form bhi nahi nikla. 2018 ke forms kb se available honge online ??? Plz aap Jo Kuch pata hai to play tell me…. Khotu chali rhuy che garib ne nahe peisa varo me admission male che aa badhu kagar uper j hoy che mara bhai o.